Shih Tzus have compact, sturdy bodies with long flowing double coats. Gentle and playful, the Shih Tzu makes a good family pet. Shih Tzus range from eight to eleven inches. Shih Tzus range from nine to sixteen pounds. Shih Tzus are white with either silver, black or brown. 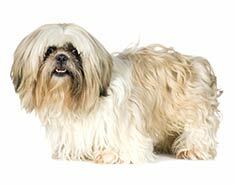 Shih Tzus have long, dense and straight coats. Daily grooming is essential to keep the Shih Tzu's coat soft. The Shih Tzu is gentle yet a lively dog. This affectionate dog breed is good with people and considered a family dog. The expected life span of the Shih Tzu is 11 to 14 years. Shih Tzus do well in apartments provided they receive regular exercise. Because of the Shih Tzu's small size, an adequate amount of exercise could be met by vigorous indoor activities or with short outdoor walks. The Shih Tzu is in the toy group. Not many dogs have religious significance, but the Shih Tzu is reported to be the oldest and smallest of the Tibetan holy dogs. The dog is sometimes called the Tibetan Lion Dog because of its lion-like face. Another name is Xi Shi quan, after Xi Shi, the most beautiful woman of ancient China. Another nickname is the Chrysanthemum Dog, due to the similarity in appearance between a mum and the Shih Tzu’s face. The Shih Tzu is small, growing to no more than 11 inches tall. Large, round, wide-set eyes in a rounded head with hanging ears are characteristic of the breed. The tail has heavy plumes and is curled up over the back. The dog has a very thick double fur coat. The top coat is long and silky, while the undercoat is woolly. The breed is shown in conformance trials with floor-length hair, but people who keep Shih Tzus as pets generally cut the hair in a style known as the pet clip, leaving the dog with somewhat of a dust mop appearance. The undercoat sheds into the top coat, rather than onto your couch. And if you regularly brush the dog, shedding is minimal. This is one of the dogs often recommended for homes where the humans have allergies. The Shih Tzu’s long hair mats very easily and is very dry. Intensive care is required to moisturize the fur and keep it de-tangled. If your dog spends a lot of time outdoors with you, walking in the woods or performing at agility competitions, you will soon find that a long-haired dog is a leaf and dirt magnet. The long hair also may interfere with eating and drinking. In fact, many Shih Tzus are given their water in the type of bottles used by gerbils or hamsters so the dog can simply lick the bottom of the spout rather than dipping his face into a bowl. 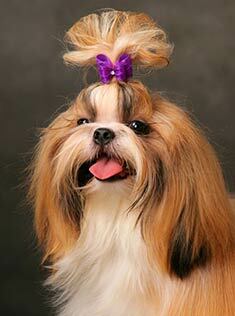 Keeping a Shih Tzu's hair in a ponytail not only looks adorable, it's practical. With a very short muzzle and fuzzy face, the Shih-Tzu is not the world’s neatest eater. You may need to wipe the dog’s face after meals with a damp paper towel. Pulling the dog’s hair into a ponytail when he eats may also help. If you choose to use a water bowl rather than the rodent-type water dispenser, be sure to supervise your dog while he is drinking. Water may enter his nose, inhibiting his breathing. Another disadvantage of the short nose is a susceptibility to high temperatures. The dog cannot cool off the hot air entering his lungs because it doesn’t have far to travel. Other health problems include portosystemic liver shunt, where the blood heading for detoxification in the liver mixes with the clean blood heading out of the liver and back into the body. This disease causes a build-up of cell waste in the bloodstream and can effect the dog’s metabolism of medications. Many Shih Tzus are allergic to red dye # 40, a common additive to pet foods. If your Shih Tzu is scratching but does not have fleas, try reading your dog food labels and eliminating red dye #40 from his diet. 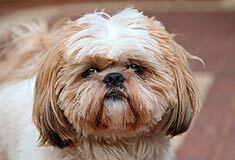 The Shih Tzu is known for producing excessive eye mucus, particularly when he is given chlorinated water from the tap. Using bottled water will reduce the amount of mucus that forms, but the eyes should still be checked daily and cleaned as needed. For the Paris Hiltons of the world, the Shih Tzu is one of the dogs used to create purse-sized designer dogs such as the Shih-poo (Shih Tzu + toy Poodle), the Shichon (Shih Tzu + Bichon Frise), the Pom Shih (Pomeranian + Shih Tzu), and the Schmaltz (Shih-Tzu + Maltese). If you are interested in a purebred, you may be interested in the colors and sizes of Shih Tzus available. According to the breed standard, any color and pattern is acceptable, even the rare livers and blues. However, some breeders will try to tell you that the “preferred” color is gold and white. Many of the other colors are fading from the scene because they have been selectively bred out. If you are planning to show your Shih Tzu, there may be some advantage to finding a dog of another color because he or she will stand out from the others in the show ring. Some breeders will try to sell you a “Teacup” or “Imperial” dog, stating that they are worth a higher price because the dog is so special. Buyer beware! There is no standard for a smaller Shih Tzu. Typically, the smaller dogs have health problems and are being gotten rid of because the breeder has no use for them. The standard weight for the breed ranges from 9 to 16 pounds. Anything smaller than that should raise your suspicions. Some prospective Shih Tzu guardians seem to prefer females to males. It is important to note that there are no gender-linked differences in this breed’s temperament. Males and females are equally affectionate and non-aggressive. Females have hormone-related coat loss, while males are easier to house train. So, there are advantages and disadvantages to each. Baby Shih Tzus are fairly slow to mature. The American Shih Tzu Club recommends that these puppies not leave their mothers until at least 12 weeks of age. If you want to see what you are getting without question, there may be some advantage in adopting an older dog from a breeder or from a shelter. When you are looking for a new addition to your household, be sure to ask the breeder some questions to find out if he is in the business only to make money or if he is truly interested in the betterment of the breed. For instance, ask how often he breeds his dogs. If he is getting his dams pregnant with every heat cycle, he is likely interested only in making a profit. Has he evaluated the temperament of the puppies? He should be able to tell you which dogs are appropriate for homes with small children and which are more shy and appropriate for senior citizens. Does he sell “leftover” puppies to pet stores or at auction? Perhaps the most important question you can ask is if the breeder will be around to give you advice and answer questions as they arise throughout the life of the dog. Really responsible breeders will even take the dog back if you cannot keep him for any reason. The Shih Tzu is not a member of the Toy Group, in spite of its small size. It is a non-sporting dog, used solely for companionship. He may bark when someone comes to the door, but he won’t attack, making him useless as a guard dog. As a companion dog, he expects and demands your attention. He wants to be taken for frequent walks; if not, he will make his own fun by running throughout your home at top speed. However, this is not a high-strung dog who requires you to play with him at all times. He is happy with a few toys while you are away at work, and once past the puppy stage, will not destroy your home if you are away for more than five minutes. The dog’s small size makes him perfect for apartment living. The dog is extremely intelligent and can be used for many different things, such as agility, conformance, and obedience shows. Some Shih Tzus are even used as therapy dogs. They can go to schools where they let the children read to them or can visit hospitals and nursing homes to entertain patients. Their sweet, clown-like personalities make them ideal for this type of work. From ancient Tibetan and Chinese heritage to the living room of modern America, the Shih Tzu is a beautiful companion and entertaining clown. His versatility makes him equally at home in the show ring or in the back yard with your children. Finding the right dog for your home is as simple as asking the right questions of your prospective breeder and waiting for the perfect dog to become available. Find Shih Tzu Puppies with our Free Breeder search!